Hi there, folks! 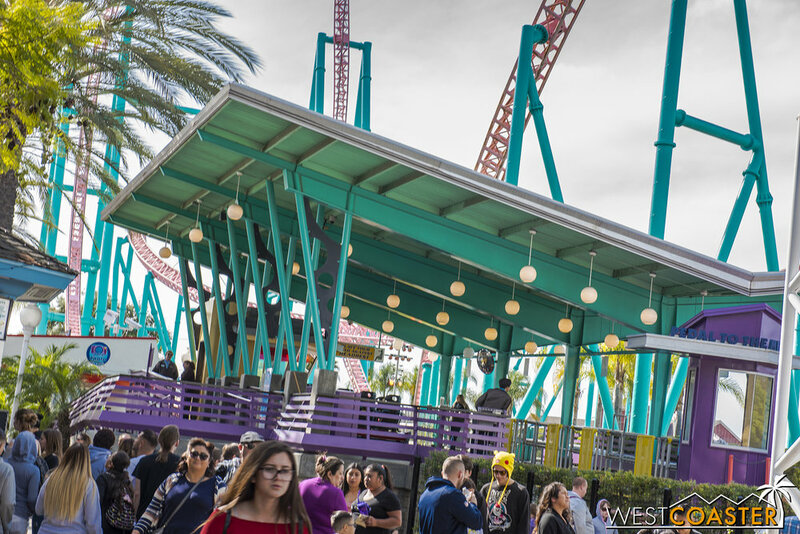 I'm balancing a busy work week in my real life world with a good amount of local parks content to push out this week, so today, we've got a quick look at the latest construction happenings at Knott's Berry Farm. And really, they concern things that are going on at The Boardwalk--highlighted by the latest progress on HangTime, of course. But that's not the only roller coaster with some developments. Read on to find out more...! HangTime wasn't testing on our visit this past weekend, and the track has been complete for over a month, now. So the primary progress has been from the architecture. The coaster station and the gift shop continue to progress, though the periodic rains this month have probably caused a few delays. Although the roller coaster was ahead of schedule, with the recent weather, I don't expect a grand opening until the end of next month at the earliest, since the buildings need to be completed in addition to the landscape and lighting. Still, the project's moving along! Will ya look at that... it's HangTime hanging over a Boardwalk BBQ on a pretty day. The track's the same. They didn't change anything. It still does the swoosh here and the loop dee loop there. And the lift hill remains a member of Knott's Boardwalk Phallicoaster Club. Joking aside, I do think the coaster looks really pretty, especially on a sunny day. The turquoise track goes well with the beachside theme. Lets take a look at how that loading station is progressing, though. They've got it sheltered at least. The laminated wood looks pretty sleek. Meanwhile, the gift shop is slowly being wrapped up. Pun intended. 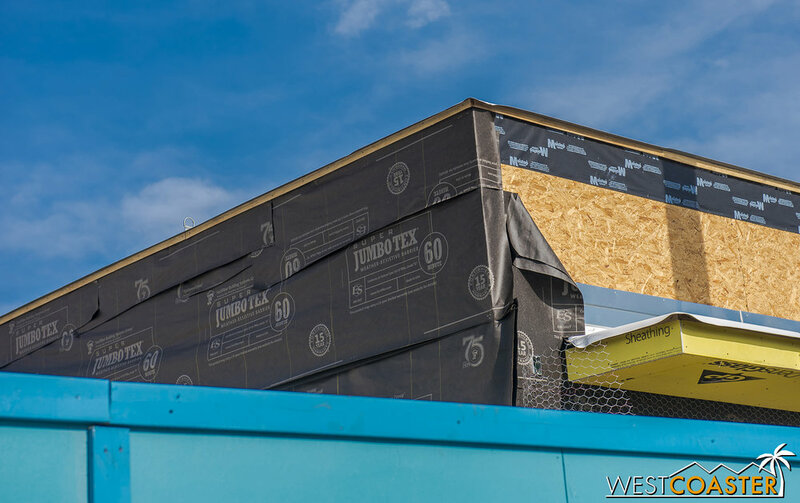 For all of you waterproofing nerds, they're using my favorite-named brand of building paper, Super Jumbo Tex. Because someone was like, "How is it?" "Not enough! Make it SUPER Jumbo! And also, name it after that guy who invented the Triangle Offense!" Here's the building from the fountain side. Putting up exterior sheathing and also a bit of a curved window clerestory feature. Although it may just be a series of acrylic panels. All the parts of a building wall, for any prospective architecture designers looking to see how parts of a building come together. Just missing exterior wall sheathing and lath and plaster. That's HangTime for this week! On Sunday, we were surprised to see that Xcelerator appeared to be testing a coaster train! 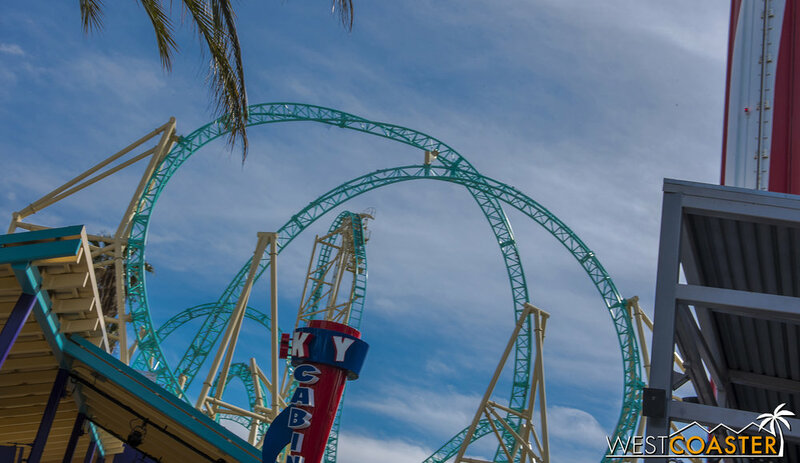 Yes, after months and months and months and months of being closed due to a mystery issue that was delayed by a "missing part" that apparently wasn't readily available, the world's first Intamin Rocket Coaster appears to finally be getting back into action. Could a reopening be imminent? Well, Xcelerator's closure has been so extended that I won't get my hopes up, but this is the most positive sign yet around this Boardwalk favorite! OMG THERE'S A TRAIN SITTING IN XCELERATOR'S STATION, ALONG WITH RIDE OPERATORS!!! AND THE TRAIN LOOKS... oh... oh my... um... it looks... Amurican. We didn't wait around long enough to catch it launching again (it appeared to have just rolled back, so the procedure was taking a while), but the ride was most definitely testing. Hope it reopens soon! Oh hey, the Sky Cabin reopened! Now you can look down on HangTime construction--although there's pretty much dirt and roller coaster track right now. The Sky Cabin is back open, which means guests now have the opportunity to get stuck on board this attraction once again! And that's it. I did say it was a quick update. But we'll be back at the Farm with a much more extensive update in the form of coverage from this year's Boysenberry Festival. Yes, the annual tradition is back for yet another year and has grown more popular than than ever. Knott's answer to the Food & Wine Festival at Disney California Adventure kicked off its 2018 run last Friday and runs through Sunday, April 8th. Check back for our sweet, fruity recap of the seasonal favorite!